One of the reasons people love coming to Las Vegas is that there’s entertainment and something to do everywhere you look. The fun never stops in Sin City and the possibilities of what you can do and see are endless. Downtown Las Vegas is known for its artistic nature and old-school charm. The best part about downtown is that there’s plenty to do for free! 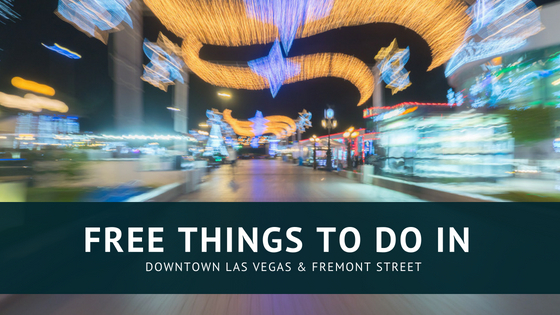 There’s so many things going on each night that you should have no trouble finding something to do, but in case you need a starting point, we’ve put together a list of some of the best free adventures in downtown Las Vegas. 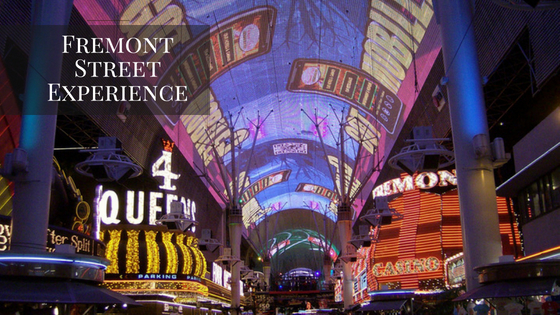 As one of the most well-known things to do in downtown Las Vegas, the Fremont Street Experience doesn’t disappoint. You will walk down a long stretch of hotels and casinos with lights overhead and music from all around. There are fun shops to explore along the Fremont Street Experience, and you can grab a drink from many different bars and take it on the walk with you! 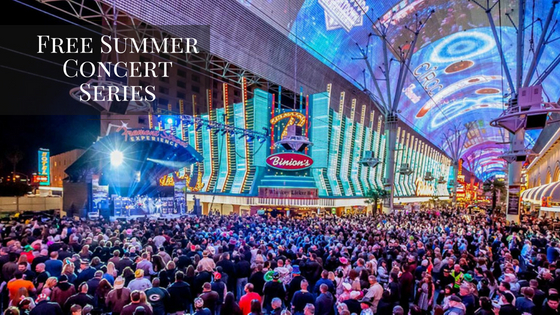 Downtown Las Vegas hosts a free summer concert series right under the lights of the Fremont Street Experience for locals and tourists to enjoy. The concerts are all free and open to the public. Most concerns start at 9 PM, and in a city that never sleeps, the fun will continue into the night. This year, there are big names coming to downtown Las Vegas like The Cult and Billy Ray Cyrus, who will be visiting downtown Las Vegas on the 4th of July. If you’re attending one of the more popular concerts, it’s suggested that you get there early to reserve a good spot, since everything is standing room only and no spots are reserved. Some of the casinos in downtown Las Vegas have been around for a long time. 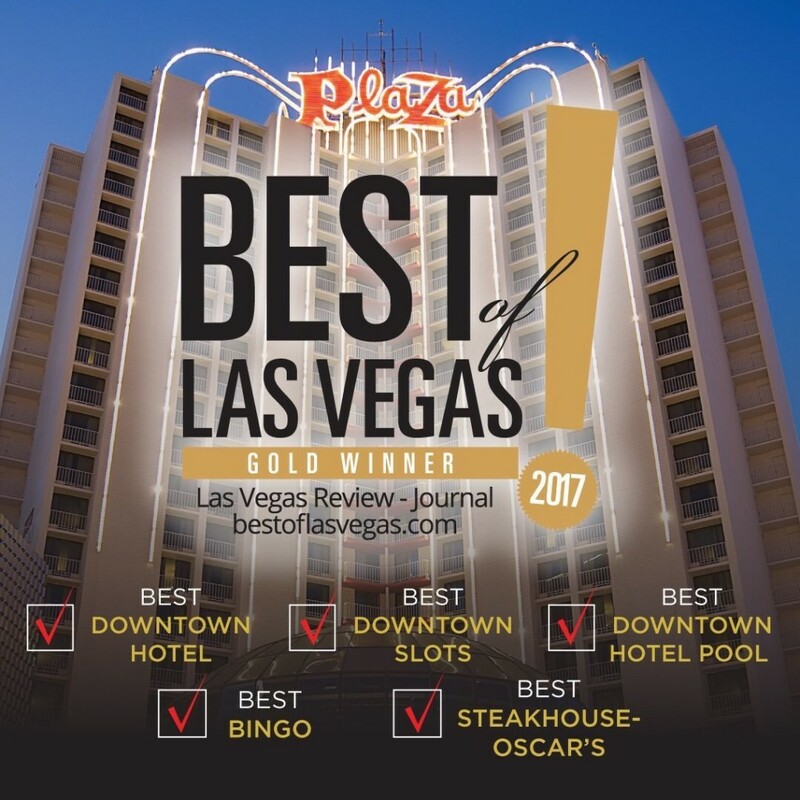 The El Cortez Hotel and Casino was purchased by famous mobsters Bugsy Siegel, Meyer Lansky, Gus Greenbaum, and Moe Sedway in 1945, four years after opening. The Plaza Hotel and Casino opened in 1971 and was the largest hotel and casino with over 500 rooms when it first opened. It’s also been the location for films and music videos such as “The Man” by well-known Las Vegas band “The Killers”. The oldest operational casino downtown, The Golden Gate, is over 100 years old. It opened in 1906 as Hotel Nevada, but was renamed in 1955 to the current name. There’s no shortage of street performers in Las Vegas, and downtown has some of the best ones. 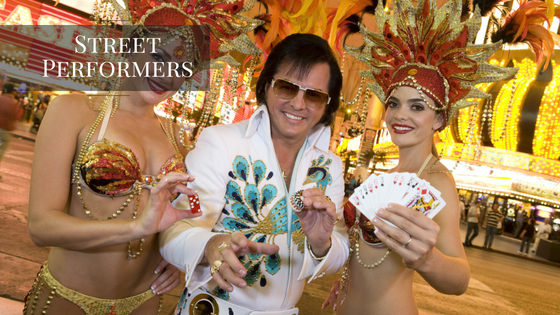 You’ll find all sorts of street acts such as musicians, rappers, magicians, illusionists, characters, and even some showgirls. Be sure to get your picture with your favorite characters as you’ll see everyone from Mickey Mouse to Spiderman walking around downtown. In classic Las Vegas style, you’ll also see some beautiful ladies and attractive gentlemen to take pictures with as well. Watching the street performers and characters is always free, but tipping is definitely encouraged. 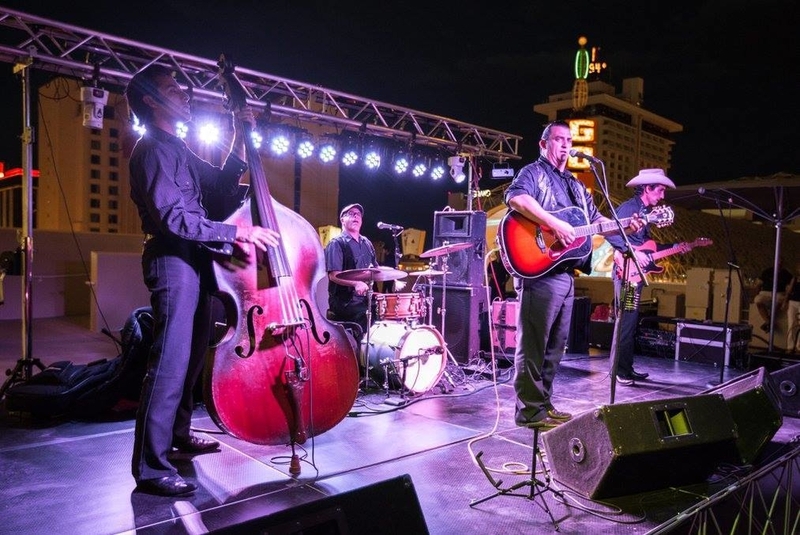 The live music in downtown Las Vegas is always playing, and many bars and restaurants have bands and musicians that come to entertain their guests. You can catch some free music at the Omaha Lounge at The Plaza Hotel & Casino, but you’re also sure to see some shows out on the Fremont Street Experience where there are bands playing almost every night. Many bars in the area also put on shows that are free to attend. Just check around and see who’s playing that night! 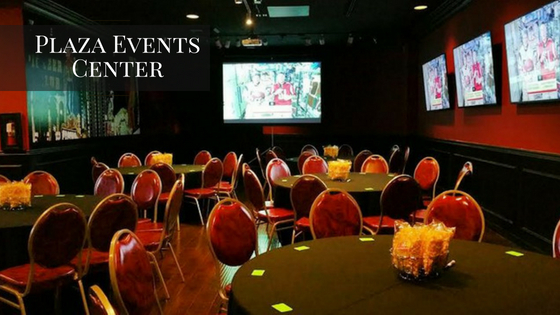 The sports scene is huge in downtown Las Vegas, and a lot of the bars in the area have viewing parties for the games. Most of the viewing parties are free and you can go cheer on your favorites and chat with other fans. Las Vegas is a very eclectic city so you’ll find just about every sport playing. One of the best things about coming to Las Vegas is the gambling, and it doesn’t get much better when you don’t have anything to lose! Some of the casinos in downtown Las Vegas offer free slot pulls. You’ll find them at Four Queens and Binion’s Gambling Hall with no strings attached. Other places offer free slot pulls, but sometimes you’ll have to listen to their pitch. When you think Las Vegas, you don’t typically think about going antiquing, but we have that too! You can take a self-guided tour of all the antiques in the Main Street Station Casino. You just pick up a map and brochure at their front desk, and explore on your own. They have chandeliers from the Coca-Cola building, a piece of the Berlin wall, stained glass from the Pullman mansion, and much more! If you want to trick your friends and family back home into thinking you won big in Las Vegas, you can take a picture with a million dollars! Inside Binion’s Gambling Hall there is a pyramid filled with a million dollars made up of bills ranging from $1 to $100, all adding up to a million. It’s free to take a picture, but you do have to be at least 21 to take a photo. You’ll even receive your photo in a nice souvenir frame. For many of us, this might be the only opportunity to ever see a million dollars, so don’t miss your chance! There’s art and architecture all over downtown Las Vegas, but the Container Park is definitely unique. It’s a park that’s made up of shipping containers, so if you’ve ever wondered what it’s like to feel like cargo, look no further! There are shops, bars, and restaurants in the containers for you to walk through and explore. Everything is completely free to walk through and check out, and there’s even a playground in the middle for kids of all ages. You’ll also find free samples from some of the food places like Jojo’s Jerky. 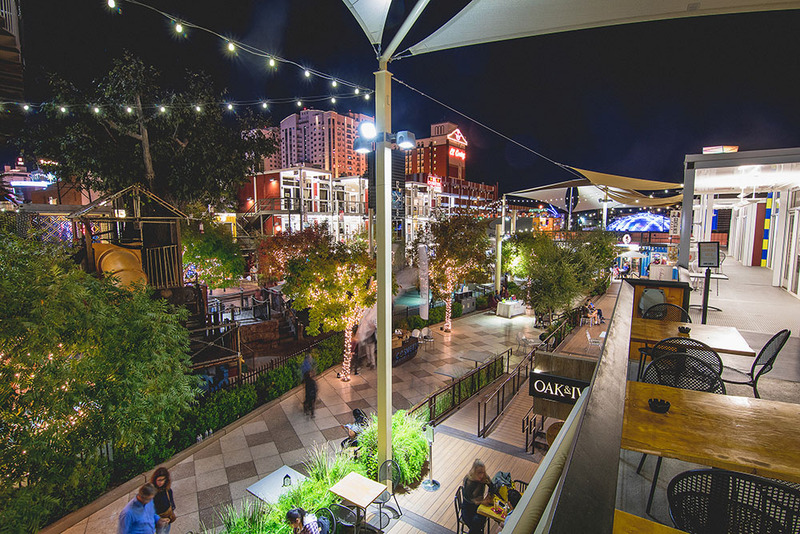 If you’re looking for some more entertainment, here’s a stage in the back that often has live music going on, so you can relax and enjoy the tunes in one of downtown Las Vegas’ most interesting atmospheres. 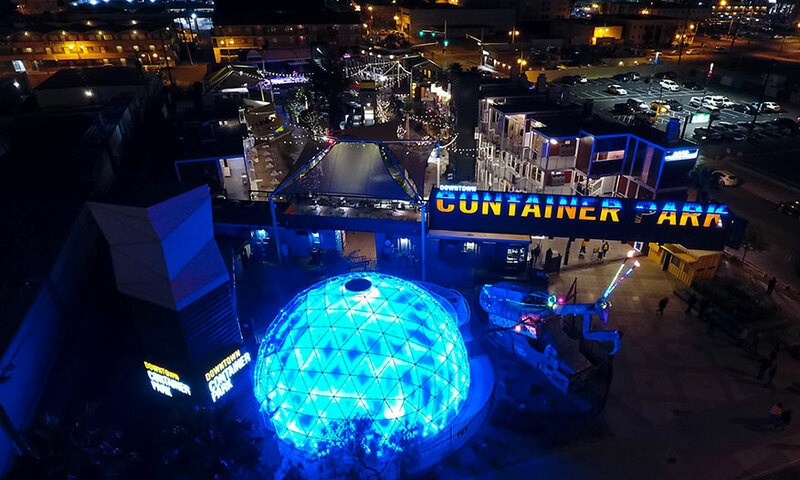 The Dome is part of Container Park, but it can be considered an attraction entirely on its own. It is an immersive 4K experience that speaks to the art culture present in downtown Las Vegas. When you enter the dome you will be surrounded by millions of pixels and an HD 360-visual display that will dazzle the senses. There are seats that recline and movie displays that play at the dome for you to immerse yourself in the experience. Some of the displays that play feature famous bands like U2 and Led Zeppelin. Other displays include Dinosaurs at Dusk and Perfect Little Planet. The tickets to the movie displays are not free. However, it is free to check out the dome and enjoy the architecture and engineering that went into building the structure. There is a 40-foot tall praying mantis that breathes fire in downtown Las Vegas. No, we’re not kidding. Aerospace artist and engineer, Kirk Jellum, created the mantis after a real-life female one that he found out in a field. The mantis is mechanically operated and breathes fire into the sky. Sometimes the mantis even dances along to music. Downtown Las Vegas is known for its art scene. There’s art everywhere you look from giant murals on the side of The Plaza Hotel & Casino to painted walls along the streets. Even many of the businesses and bars downtown can be considered works of art in their own way. There’s plenty of art to enjoy while having an adventure downtown.